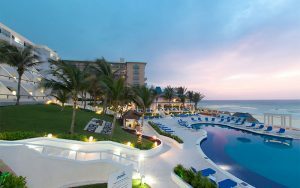 Join the Geneva Historical Society and First Choice Travel for a winter getaway to Cancun, Mexico. Enjoy fun in the sun instead of shoveling snow! From February 3 to 10, 2018 travelers will stay at the Golden Parnassus Resort and Spa. The Golden Parnassus Resort is an adult-only all-inclusive resort. Special features of the resort include six restaurants, three pools, non-motorized water sports, and nightly entertainment. The cost is $1,599 per person double occupancy. A $300 nonrefundable deposit is due by July 31, 2017. A valid passport is required for travel. Trip cancellation insurance is also available and is highly recommended. The price includes roundtrip motor coach transportation to Hamilton (Ontario), roundtrip nonstop flight from Hamilton to Cancun, all airport transfers, seven night’s accommodations, all meals and beverages, and taxes. More information about the trip will be available at two informational meetings on Tuesday, July 18 at 3:30 and 6:30 p.m. at the Geneva History Museum, 543 South Main Street. For more information about the meetings or the trip, call the Geneva Historical Society or visit www.genevahistoricalsociety.com. If you are planning to attend either of the meetings, please call the Historical Society at 315-789-5151.